I know, I know... a museum devoted to sewers? Who in their right mind would want to see that? 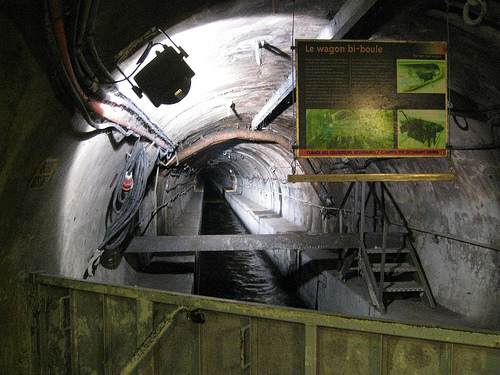 Apparently a lot of people, as the Sewer Musem (Le Musée des Égouts de Paris) is one of the most visited sites in Paris' famed Left Bank. Many of the visitors that come are fans of Victor Hugo's 'Les Miserables' as a famous scene in the novel took place in Paris' 'underground.' A scene in the musical 'Les Mis' (based on the book) is also a draw to some. Others are just curious about the sewer system, which is one of the oldest in the world, having been built on order by the then monarch in the early 13th century. Some people are just drawn to visiting tourist attractions that are off the beaten tract - everyone brags about visiting the Eiffel Tower, but how many people travel to visit a museum devoted to waste disposal? Oh, and incidentally, there are restrooms about half-way through the guided tour. Many people wonder what happens if a guest has to 'go' during a tour. Don't worry. There is actually a separate connection pipe for the system, so one should not worry about all that wine ending up at the feet of others in their tour group. Open: Winter -11 a.m.-4 p.m. - Summer 11 a.m.-5 p.m.
Closed: Thursday, Friday, 3 last weeks in January. Last updated by Josh M. on 23 January, 2011 in Destinations. It's on my list for the next Paris trip, last time didn't have time to do more than taking a look at Centre Georges Pompidou. Question though, does it smell or is it fine? I loved the museum. I thought it was actually really interesting.